We’re holding our Honey Show together with North Bucks BKA and Buckingham BKA this year at Buckingham Garden Centre on Sunday 25th September 2016. Buckingham Garden Centre has a lovely restaurant where you can take lunch, but you will need to queue with all other visitors to the centre. BUT if you are coming to our event then you need to let Andrew Beer know that you want lunch booking for you and avoid the queue. His details are at the bottom of the poster below. Here’s the form. Without a booking you’ll have to queue up for lunch in the main restaurant. Please complete and return SHOW REGISTRATION FORM and SHOW ENTRY FORM further down this page. Yes, Bucks County BKA is having a honey show. This year we are sharing it with North Bucks BKA (NBBKA) and Buckingham and District BKA (B&D). 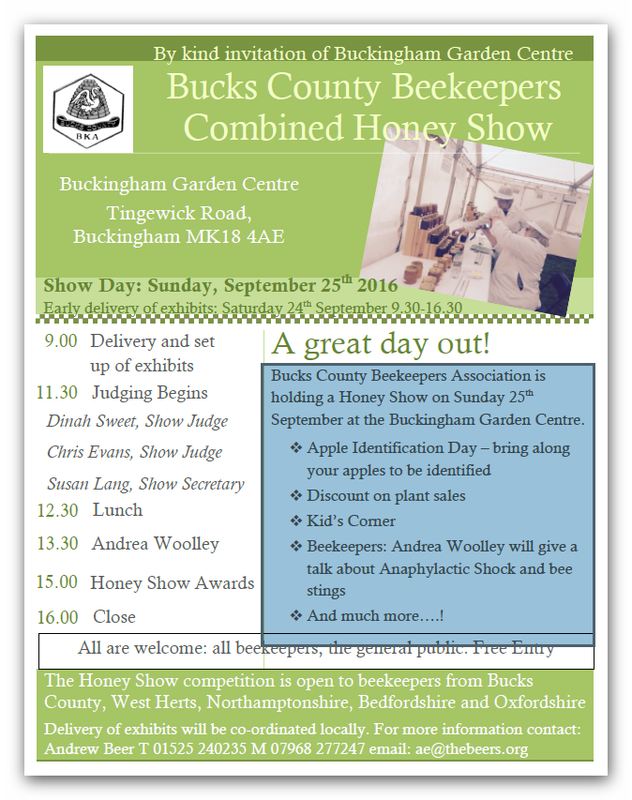 Our Honey Show will be at the Buckingham Garden Centre, Tingewick Road, Buckingham MK8 4AE, Tel 01280 822133 . Buckingham Garden Centre is one of the largest privately owned garden centres in the country, and we are delighted to be invited as guests. – Sunday 25th September – Buckingham Garden Centre, the second day of its hugely popular annual Apple Days weekend. At the 2015 ‘Apple’ Weekend, our NBBKA and B&D bees and their products and even we beekeepers were the stars of the show – how gratifying that the interest of the general public about bees never wanes. Each year B&D take a stand – this year it has kindly agreed that members of each of other Associations can join the fun. Well, what is going to happen? A lot! Obviously a lot of apples will be on display for you to view, and select. But you will be able to bring for identification your own apples for all those varieties whose names you always wanted to know, or in my case, have forgotten. Gerry Edwards ,also a beekeeper and member of Harrow BKA will be on hand to advise, but he is very much a gardening expert; so do have your questions ready for him. Question: Did you know that if you leave Autumn raspberries un-pruned you get a second crop in the Spring?! A gem from Gerry’s advice last year – and you can buy his book about fruit! Other activities. The Centre arranges a number of other activities over the Apple Day weekend all for you to enjoy. But there is much more besides. The Centre has a vast range of plants and its own separate nursery – a wonderful opportunity to make your autumn purchases – wallflowers and bulbs come to mind – but there is much much more; perhaps especially their ranges of clothing, tools and garden furniture. And for plants: as a member of one of the associations, you can join up for their Garden Centre Card Discount Plant Scheme. So what of the Honey Show? The first thing to explain is that we will have two allocated areas within the Centre. Area 1 This will be a glazed covered area sufficiently large for honey show exhibits, including tables and chairs for judges, judges’ assistants and honey show secretary; secondly for what might be described as public activities including Kids’ Corner, public information desk, hive products sampling table, skep making and live bees. B&D will be running a stall and will have honey and hive products for sale. We will try to interface the show tables with vegetation of all sorts to bring colour and interest. The public will, of course, be excluded from the judging area until judging is finished. Area 2 This area will be available for three purposes. Public information talks about bees; for beekeepers and their guests an anaphylactic shock course, and lunch. As the building is fairly bare, some floral decorations will be displayed. Setting Up A team from NBBKA will set up the show on Saturday 24th September starting at 9 am. Area 1 will be ‘manned’ until Garden Centre closing hour (4 pm) to receive entries and secure them (see below). The centre is closed and secured over Saturday night. Entries for the Honey Show can be left at the Garden Centre either on Saturday (see above) or up to 10.30 am on Sunday. To reduce the workload of the Honey Show Secretary, those intending to exhibit will receive in advance (through associations please) entry instructions including labelling in addition to show schedules. The intention is to speed up the processing of entries. No entry fees will be charged for the Honey Show. FOR FURTHER DETAILS, please read SHOW ENTRY FORM. Travelling to Buckingham will be inconvenient due to distance for some, especially if requiring two separate trips: One to deliver exhibits and another to attend the show. To lessen the inconvenience, we invite each association to ask specific members to act as exhibit carriers to lessen both the number of journeys and to avoid the need for some people to travel to Buckingham before the start of the show. Judges: Diana Sweet, who will need no introduction, and Chris Evans, junior judge. Judges’ Stewards: Stuart and Sandra Knox (NBBKA). Bill Fisher and Sue Carter (Chalfonts Beekeeping Society). 9.00 Area 1 Doors open to receive and set up honey show entries. No entries accepted after 10.30. 9.00 Area 2 Teas, coffees and biscuits bar opens and will close at 15.00. 12.30 Area 2 Lunch to be provided by Garden Centre Restaurant Staff: Chilli & rice, Mild chicken curry & rice, Vegetarian Pasta bake, and salad. Cost: £6 per person. The Centre has a good reasonably-priced restaurant serving a wide variety of foods and soft drinks, but it can get very busy in the middle of the day – this is a prime reason for arranging lunches in Area 2. 13.30 Area 2 Talk: ‘Anaphylactic Shock’ – Andrea Woolley. ENTRY FREE. NO ONE should undertake beekeeping without being familiar with this severe medical condition or unable to act in an emergency. This course is a must for anyone who cannot deal with an anaphylactic shock emergency. 15.00 Area 1 Judging finishes. Exhibits area open to the general public and association/district members. 15.00 Results of judging – Prize giving. 16.30 Garden Centre closes. All association members to be off site. A team from Stewkley will remove tables/chairs from Garden Centre. Any exhibits uncollected will be taken to Stewkley and retrieved through me. • Let us not forget that none of this would be possible without immense support from the garden centre and B & D BKA, our respective hosts. Thanks very much to them. PLEASE COMPLETE AND RETURN SHOW REGISTRATION FORM AND SHOW ENTRY FORM. THANK YOU. ARE YOU UP TO SPEED with the various new regulations affecting honey including honey for sale, for example did you know that if a “Best before date” is not shown on the main label then the main label NOW has to state where it will be found e.g. for best before date – see lid? If anyone cares to bring their current labels / jars to the show I will be happy to offer my personal views but cannot give advice. Trophies and Rules added at bottom of this page. To reduce complexity, only one entry per class will be permitted at this joint show. The entrant will be sent a sheet of labels covering all classes, please advise below which classes you think you will be entering. There is no penalty for not providing an entry for a class (i.e. if your cake sinks! ), this list provides the Honey Show Secretary the quantity of entries to be expected, and how much space to allocate each class. All Honey Entries must be in standard 1lb (454g) Squat Honey Jars with screw or twist on lids. Lids may be plain metal or plastic. 4 Two matching 1lb jars of naturally crystallised honey. 4a Two matching 1lb jars of soft set/crystallised honey. 11 A single jar of honey, wrapped in foil or painted black. – To be judged on taste and aroma only. All Wax in classes 12 to 15 inclusive must be beekeepers own. This rule does not apply to class 15a. 14 Six matching cakes of beeswax. Each 28g . 15a Three matching beeswax candles Dipped or from a mould displayed erect, ready to burn. No decoration or dyes to be used. 15b Three matching beeswax candles Rolled, displayed erect, ready to burn. No decoration or dyes to be used. Method: Cream butter and honey together, beat eggs well and add alternately with sifted flour and salt. Add fruit, etc. Beat well and lightly. Bake in a well buttered 7″ round tin (between 6″ and 8″), 2 to 3 hours in a moderate oven. 22b Photograph taken by Beekeeper, showing any of the following: Honey, beeswax, honeybees, the craft of beekeeping, Beekeeping through the seasons. A4 size maximum, may be mounted or unmounted. Frame of Honey in beeproof case ready for extraction. 1m x 1m x 1m display space. To include: Honey ready for sale. Beeswax for sale in any form, any other Beekeeping items for sale (can include fudge/sweets/cakes). Current legislation for labelling must be followed for all items. 101. Two 1lb jars of light honey. 102. Two 1lb jars of medium honey. 103. Two 1lb jars of dark honey. 104. Two 1lb jars of naturally crystallized (not stirred) honey. 105. Two 1lb jars of soft-set or creamed honey. 106. One jar of liquid honey judged solely on taste and aroma (to be shown in a transparent 1lb jar). 107. One frame of capped honey for extraction (may be granulated). 108. One carton of (unwired) cut comb to be judged by appearance only. 109. One bottle sweet mead. 110. One bottle dry mead. 111. One cake of beeswax 200-255g (7oz – 9oz). 112. Two matching beeswax candles in holders. One to be lit by the judge. 113. Beginners class: One 1lb jar of honey. 114. One honey cake – see recipe below. Recipe for honey cake – class 114. Ingredients: 5 oz butter, 6 oz exhibitors own honey, 4 oz soft brown sugar, 2 eggs, 7 oz self raising flour, 1 tablespoon water or milk. Peggy Cup: for the BCBKA member gaining the most points overall. Margery Parker Trophy: for the best honey cake in class 114. John Raven Award: for the best honey exhibit in classes 101 to 105. 1. All exhibits in classes 101-115 shall include or be the produce of the entrant’s own hives. 2. An exhibitor may make multiple entries in each class but may receive only one award for that class. 3. Extracted honey must be exibited in plain, clear, 454g (1lb) squat jars (glass or plastic) with standard gold lacquered metal, or gold plastic, screw tops or twist-offs, and matching, except where otherwise stated. Honey colour will be assessed by means of BD filters (available for use on day of Show). 4. Where two jars of honey are required, they should be matching in colour and consistency. 5. Class 107: Each frame must be submitted in an undecorated bee-proof showcase. The full comb must be visible from both sides and the frame capable of being lifted out of the case. 6. Class 108: Cut comb is to be exhibited in standard 8oz rectangular containers with transparent lids. 7. Class 111: Beeswax may be exhibited either polished or unpolished, in a suitable container with a transparent lid or on a plate in an unsealed plastic bag. 8. Class 112: Candles may be rolled, dipped or moulded. Candles must be displayed in stable candleholders. 9. Mead must be in clear colourless bottles without fluting or any decoration. The bottle should be between 20-30 fl oz (591-887 ml) and filled to within 1″ (25.4 mm)•of the bottom of a cork stopper with white plastic flange. 10. Class 113: a “Beginner” will in be their first or second year of beekeeping. 11. Class 114: Cake to be displayed on a paper plate and in a plastic bag provided by the steward, which can be removed for judging. 12. Labels for each exhibit will be provided by the show secretary immediately prior to the show and should be placed on each exhibit as follows:- Jars (honey/mead) – label to be placed horizontally half an inch (12mm) up from base of jar Frame – label to be placed on top of frame and one on showcase, top right hand corner Cut Comb – label to be placed at top right hand corner of lid and one on side of the container Wax – label to be placed on plastic bag or container or on base of block Cake – label to be placed on plastic bag and one on plate Candle – label to be placed on card in front of the exhibit. Download and complete the entry form at the top of this page and return to Sue Lang, NBBKA Honey Show Secretary as listed at the foot of the entry form.